Spring is in the air at The Lake Hotel, Killarney. 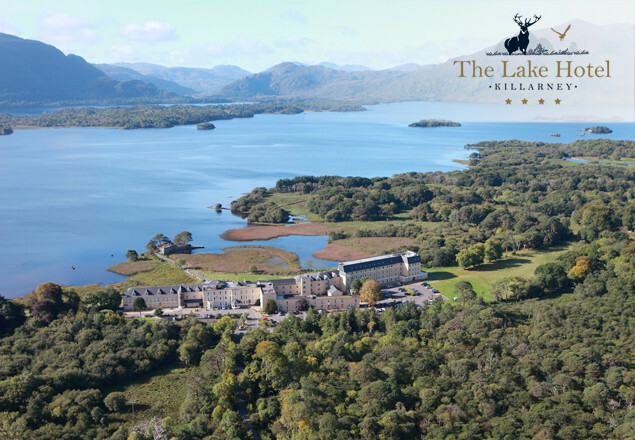 Rewarding Times are delighted to team up with The Lake Hotel, Killarney again to offer you the following 2 night break for two people. Relax in a beautifully appointed Deluxe Lake View room with one of the most spectacular views in Kerry. Enjoy two night’s accommodation with breakfast included each morning and a 3 course table d’hote dinner on one evening in the elegant Castlelough Restaurant, recently awarded its second AA rosette. Also included in your offer is a complimentary drink per person to be enjoyed once during your stay, chocolates in room on arrival and an additional amenity available only to Rewarding Times clients of a complimentary late checkout - all for only €299. Vouchers are not valid for use from 16-18 March inclusive and 30th March to 2nd April inclusive. Complimentary drink per person once during stay included in offer is for service in public areas, a room service charge will be incurred if they are requested to the room. Complimentary drink included in offer is a glass of house wine, pint of beer or soft drink, all other drinks charged as usual. Please note - your voucher must be used by 3rd May 2018. This redemption date is firm. No correspondence will be entered into regarding late redemption of your voucher.